They say that it is important to measure the performance of the business. Moreover, it is important to measure not just the hours spend on job, but the results and their connection to the ultimate goals. The solution to this challenge is in proper strategy description and execution. Executives prefer to use business scorecards to formalize their challenges and report the performance against specified goals. Find below some reports from our users. Learn more about measuring and controlling performance with Balanced Scorecard. We use BSC Designer for measuring performance rather than effort. It has been a challenge in our small consulting firm. BSC Designer has allowed us to evaluate results in more than one way. Now we can reward efforts that we are sure are creating the desired results. Our staff feels comfortable with their new KPIs and haven been motivated individually and as a team as a result of the implementation of the BSC software solution. Margaret, thank you for your insightful feedback. You did a great job implementing business scorecard in your company. According to recent surveys most companies use business scorecards only as a plain management tool. On your example, I see that it is implemented in your management and reward system and is actually accepted by line-level employees. I think you are on the right track in measuring the ultimate performance, rather than measuring just an effort that has been invested. It is great that your approach works for motivational purposes. Employees need to see the big picture of what’s happening and a properly designed strategy map and KPIs will certainly help. 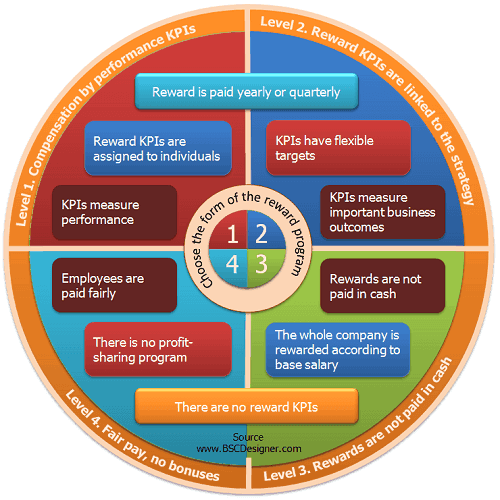 If you will plan to expand your KPI system to reward, check out this article first. It might be tricky using KPIs for a reward system and best practices from some companies show that it is better to avoid financial incentives. One more motivational “trick” that we can recommend is to design a strategy map. Properly designed strategy maps will help your employees to see the big picture of what’s happening. Check out another discussion on this topic here. What do you measure and reward in your? The work done or the performance results achieved? I invite all business professionals to share their thoughts in the comments. How can one find a balance between rewarding the for the effort and rewarding for the performance results? The SA Army has made a decision to implement the BSC Designer as a strategy tool in order to improve business performance. Typical tasks will include designing of a strategy map, defining objectives, defining measures and controlling implementation using easy to follow dashboards. We have a very good experience with BSC Designer, as this instrument can facilitate the implementation of the Balanced Scorecard in our unit. We have been trying to design a MS Excel spreadsheet but this approach proved to be more difficult than anticipated. BSC Designer, therefore, is very welcome attempt at an electronic version of the Balanced Scorecard. Thank you for your feedback. 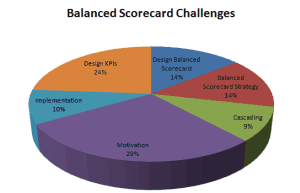 Many business professionals tried to use an MS Excel spreadsheet for the Balanced Scorecard. It might work for smaller projects where only one person accesses the scorecard. When a team is growing employees and starts exchanging Excel spreadsheets, it becomes time consuming and involves unnecessary efforts. With this approach it is hard to use the Balanced Scorecard for strategy execution. As a result companies face a motivation problem as employees don’t like to use a tool that they are not comfortable with. Excel is fine for presenting data tables, and charts, but for the Balanced Scorecard a professional tool is preferred. You mentioned that you control the implementation of the strategy using a dashboard. In the latest versions you can do even more. BSC Designer now can display performance data directly onto the strategy map. You can have your strategy map with objectives linked to each other and BSC Designer will also visualize KPIs that are aligned to business objectives. In this way you can use a strategy map to have a look at what’s going on. You can add to the strategy map performance or progress indicators. If you need more details you can switch to the dashboard. We use BSC Designer to measure project performance relative to the overall strategic plan. BSC Designer is simple and easy to use. It provides an invaluable overarching view of the performance levels at any point in time. It gives management a snapshot of the organization’s performance in pursuit of the strategic goals thereby allowing management to make informed decisions regarding corrective, mitigation, or evasive actions. IIS is an IT Consulting Company that is providing quality products in software application technology. We are committed in delivering products and service that meet customer’s needs. We have embarked on an exercise of quality improvements strategy by implementing ISO 9001:2008 Quality Management System standards. IIS recruits highly skilled, experienced professionals with a wide range of technology platforms and knowledge of best practices. Thank you for sharing your experience with BSC Designer. Glad to see that our software helps you to make better decisions basing on the information provided. I believe that this is the purpose of having a Balanced Scorecard in any company. What seemed to be complicated before, after a proper strategic mapping is getting clearer. If BSC Designer software has an access to your data via automated interfaces (SQL indicators or Excel link), then you can check out not only actual data, but compare it to some historical values. It is really useful to plan future improvements. There is one thing that I’d like to warn you about. I saw many companies where performance indicators are aggregated into a single performance index that suppose to show the total performance of the company. This index might be used for some bureaucratic aspects of the company, but it has nothing to do with the real performance picture. Information in this index is over aggregated and doesn’t make any sense. Our recommendation regarding an overarching view is to focus on the most important KPIs, it might be 4-6. These KPIs will be in a top level scorecard. If necessary you can drill down to see the details and the source of the data. Currently I am trying to find a set of measurements focusing on teachers’ performance in engineering institutions. BSC Designer has an excellent graphical user interface. I personally feel that there should more free training offered for the product. As it can be easily figured out that the product is good, but how one can really use it if there is no sufficient training. Kindly, make the video training offers through widely accepted media such as You Tube, Your Own Blogs, etc. The ultimate success of a change strategy depends greatly on how the change is introduced and implemented, rather than on the merit of the strategy itself. Successful development and utilization of balance scorecards, key performance indicators in the workplace is identified by the presence or absence of linkage between measures and performance apart from reporting. Reporting performance is an art, where BSC Designer is playing important role by providing various BSC reports in different formats. I personally feel that product can be very useful for both the new comer to the field and for the experts as well. Thank you a lot for sharing your ideas! Actually, we have a lot of video training for BSC Designer. Please, follow the link to find the one that you need. If you have a question that was not answered in the training, feel free to contact us. I agree, that the importance of an alignment in the Balanced Scorecard cannot be overestimated. With BSC Designer software we are providing the tool that can help a lot, but still the final implementation and usage of the concept depends on top managers of the company. What we believe is that once a strategy is clearly defined, it is much easier for the implementation. For example, if there are properly introduced KPIs that are not simple metrics, but real KPIs that focus on desired performance result, it will be much easier for a top manager to execute company’s strategy with success. The latest version of BSC Designer provides a lot of functions that can make the strategy design process easier and more transparent. For example, it is possible to build a strategy map where the linkage that you mentioned in your feedback is realized. 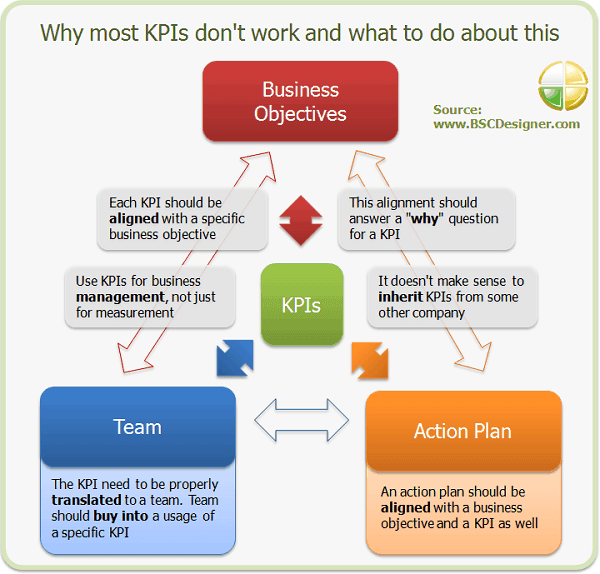 Moreover, it is not just about aligning of KPI with a business objectives, it is necessary to align an action plans with other important items of the strategy. I’ll be using the BSC Designer Pro tool to build an alignment of the vision, clarify strategic objectives, and identify the organization’s critical vectors. In corporate governance, the traditional ways of measuring performance always pointed to financial and operational indicators, not allowing that other perspectives measurement could be taken. The Balanced Score Card enables the quantification of intangible aspects, such as information, people and culture, within an organization. This system provides the company’s senior management with a wide, and at the same time, immediate comprehensive view. The Balanced Score Card provides an evaluation that includes also the results of past actions, future performance driving through three sets of operational indicators that are related to customer satisfaction, with internal processes, and gives you the ability to learn and improve. In other words, the BSC indicates the knowledge, skills and systems that employees need to innovate and develop the right strategic capabilities and efficiencies that can provide specific value to the market, which ultimately results in a greater value for shareholders. This revolutionized key performance indicator system, has led many companies to adopt the system for over two decades now, and they have made use of it not only as a measurement system, but went much more ahead, and they began to adopt it as a strategic management system. With the implementation of Balanced Score Card in 1992, Kaplan and Norton returned to the theme again and again, perfecting important methodological contribution to the strategic alignment of business. Their methods help managers to maintain control over complexity. That characterizes it as a truly revolutionary method. With great skill the BSC Designer Team is also collaborating with this evolution, by developing a custom made tools, so that businessmen can materialize and practice Kaplan and Norton’s revolution. If on one hand the evolution of this extraordinary concept, created by two authorities on the area is Must Required Reading, on the other hand, the practical application of this method is possible via a software that will help the entrepreneur interested in innovative tools for measuring the companies’ performance, and the implementation of their strategies. They are helping to improve management! Thank you a lot for your comments. I find your words to be focused on the matter of things. The Balanced Scorecard concept is must-have and must-learn in any company. Companies use it or its modifications as main strategic planning and execution tool. 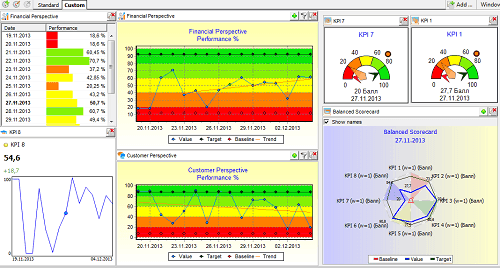 Still there is a need for a simple, easy to use software product for the Balanced Scorecard. I believe we did a good job creating BSC Designer. There are users who think that BSC Designer is easy to use for novices, easy to understand, and even has helped to understand the BSC method. There is a certain gap between how people understand the Balanced Scorecard and how it was introduced in Norton & Kaplan’s works. In most cases people talk about four perspectives and a rectangle diagram that doesn’t help a lot and actually was removed from later publications by the authors of the concept. The clue to the Balanced Scorecard is a strategy map, where business objectives are represented taking into account a cause-and-effect connections. For sure, BSC Designer supports this approach. Anyone can follow the link and learn how to create a big-picture strategy map in BSC Designer. After a thorough and extensive process of selection and after seeing a lot of international and national providers for a Balanced Scorecard tool, we have decided for using BSC Designer PRO. We found it by chance and have been performing extensive trials and we have found a powerful yet easy to use tool that matches our requirements at an affordable price. Is the only tool that we have seen that matches our needs at full. The dashboards are flexible, comprehensible and surprisingly friendly to use. The result graphics are useful and the HTML reports are great to track the performance of our organization and to communicate results for clients and stakeholders. In addition they have been really supportive and a great help in our testing period. We would gladly participate to help develop BSC Designer to a higher stage. Thank you very much, it is a powerful tool that will help us to meet our goals. Camilo, thank you again for choosing BSC Designer. I’d like to analyze your feedback and share some useful links so that other users and potential clients can explore the product. First of all, I agree that BSC Designer is an internationally recognized software. The reason is not just that this product is feature-rich, but that its interface was localized to many languages. I think you have worked with a Spanish version, but the product is available in Arabic and Chinese as well. Regarding the price, yes, it is affordable, and unlike other vendors we don’t hide it. Anyone can go to the ordering page and check out the current pricing for all editions. Also, we have some recommended implementation schemes, as BSC is not about one person; it is about usage in the entire company. I’m glad that you are using dashboards in BSC Designer. I know that people like to have a separate dash boarding software and even are trying to export KPIs there. However, I believe that is a wrong strategy, as in this way all the valuable information they have in the BSC will be lost. Here is a detailed article that explains the right approach to dashboards. It is great that you are using HTML reports to track the performance. I would also recommend uploading your HTML reports to the company server (there is such as feature), so it will be easier to share the report with your colleagues. 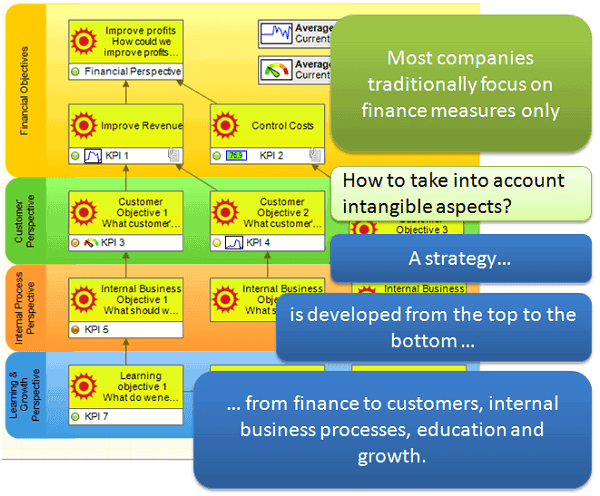 Also, one of the key parts of the Balanced Scorecard is a strategy map where you can put your business objectives. You can export the strategy map and share it with your colleagues as well. Finally, everything is online today, so we now have a web-based edition of BSC Designer. It is almost as powerful as the desktop edition. You can even work with strategy maps online. Give it a try! As you see, we have a lot of news to share. I suggest you to follow us on Facebook or Google Plus, where we always post important updates. After setting up business processes for accounting software implementation, there is often a need to monitor staff & software performance. Implementing BSC KPIs surely did the job. Before BSC Designer came up, I have always encountered organizations implementing old and setting up new business processes. The intention is to make the business unit (say Accounting Department) perform as a cohesive unit. Unfortunately, people tend to go back to their comfort zones and go off track. As a result delivery time (of reports) to internal customers have not significantly improved or did not improve at all. 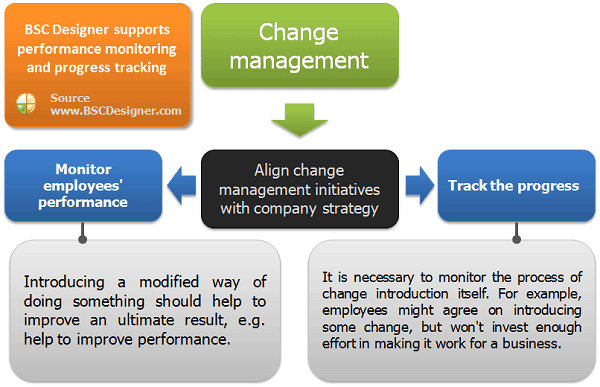 Change management had its limitations so the performance had to be constantly monitored. Thank you for your feedback. Change management that you mentioned was recognized as one of 25 most popular business tools in a recent research. And I agree, there is still a need for a tool that will align change management initiatives with company strategy and keep track of the improvement process. Good to see that you have a positive experience about using the Balanced Scorecard and our BSC Designer for this purpose. I think an improved approach in this case might be creating a separate strategy map for change management objectives and adding KPIs that will monitor the performance during the transformation process. With change management this will help to solve two main problems that you mentioned in your feedback: monitoring performance and tracking progress. Monitor employees’ performance. The logic here is that introducing a modified way of doing something should help to improve an ultimate result, e.g. help to improve performance. Example: A company introduces new templates and instructions to a customer support service. What happened with the “return problems rate”? What if it decreased? If it stayed on the same level or increased? Any answer will be a signal for a manager to do a more detailed research. Track the progress. It is necessary to monitor the process of change introduction itself. For example, employees might agree on introducing some change, but won’t invest enough effort in making it work for a business. Example: an employee had to prepare 10 answer templates to improve a response quality and decrease a response time. What number of templates was actually designed? How many of them are actually in use by employees? These KPIs will give us more information about the change process itself. For sure, BSC Designer supports performance monitoring and progress tracking, as we talked about these two functions of the Balanced Scorecard in a previous article.